Technology is replacing jobs. Are you ready? Americans generally enjoy what they do for a living, but they are concerned about diminishing job security. So finds a new report from the Pew Research Center, in association with the Markle Foundation. 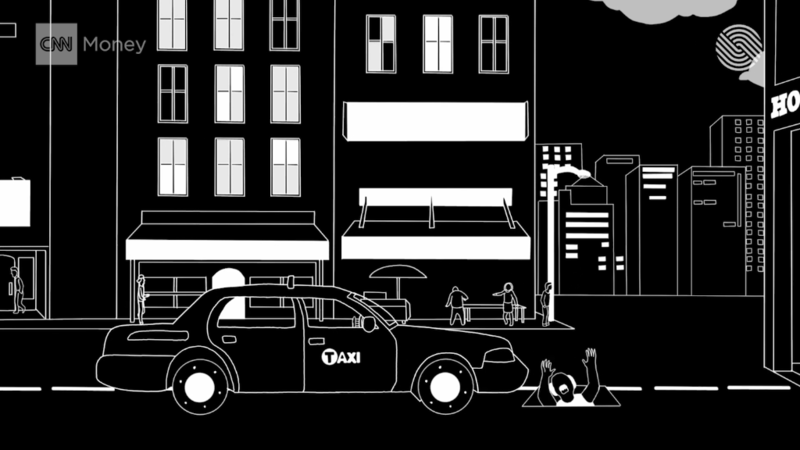 The study looked at how the shifting economic landscape is reshaping work and society. The findings are based on interviews with 5,006 adults conducted in May and June and also Census data. The 2016 presidential election has shone a spotlight on jobs and whether Americans today need a college degree to get ahead, or even just to tread water, as well as the impact of globalization and trade on American workers. 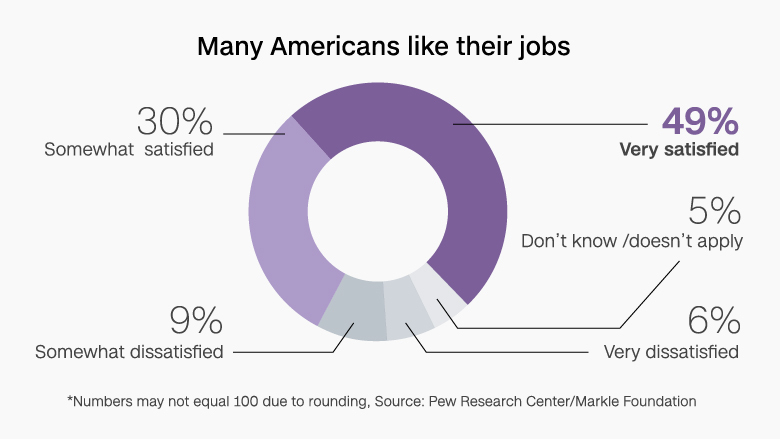 Pew's study found the vast majority of Americans are happy with their jobs. Some 49% say they are very satisfied and another 30% say they are somewhat satisfied with their current employment, the study found. Only about 15% said they were either very dissatisfied or somewhat dissatisfied with their positions. Workers are also holding onto their jobs longer than in the past. The share of folks who've been with their current employer for at least five years rose to 51% in 2014, up from 46% in 1996, according to Census figures Pew analyzed for the study. This is especially true among older workers. Some 76% were working at the same company for at least five years in 2014, up from 67% in 1996. They are also putting in more hours. 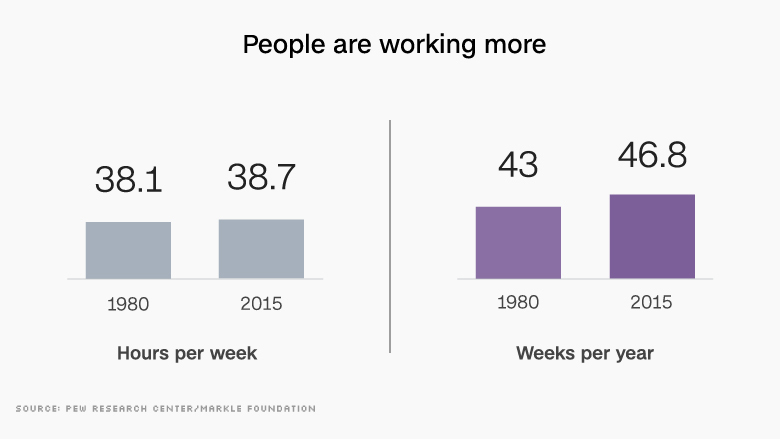 Americans worked 46.8 weeks a year, on average, in 2015, up from 43 weeks in 1980. Most Americans don't feel they'll lose their positions in the next year, but they are more concerned about job security. Some 63% say that workers have less security now than they did 20 to 30 years ago, while only 16% say such confidence has increased. For those who are unemployed, it's not easy to find another job, respondents said. Some 65% said good jobs are difficult to find in their local area. While this is lower than the 84% who felt this way in 2009, at the height of the recession, it's still higher than the 55% who said so in mid-2007. Additional education is crucial to holding onto jobs and advancing in the profession, workers said. Some 87% said it's either essential or important for them to get training and develop new skills throughout their career to keep up with changes in the workplace. The changing economy has left many Americans feeling left behind. This is particularly true of those without college degrees, the so-called working class who make up the base of Donald Trump's support. Some 72% of respondents said Americans bear a lot of the responsibility to secure the skills and education needed to succeed in today's economy. Some 60% feel the responsibility falls on K-12 schools. But only 16% feel that a four-year degree prepares students very well for a well-paying job in today's economy. As for threats to job security, Americans see them in many places. Eight in 10 adults felt that increased outsourcing is hurting American workers, while nearly the same share feel that having more foreign-made products sold in the U.S. has been a problem. Some 57% feel the increased use of contract or temporary workers is harmful, while nearly half said the decline in union membership has hurt workers.